Next to a reliable rifle, the three-legged advantage can be a deer hunter’s most indispensable accessory. White-tailed deer learn at a very young age to look before they leap into open pastures. Over time, they also discover the primary function of deer stands. On heavily hunted properties, it would be hard for them not to. It’s not exactly subtle when the same group of rifle-toting hopefuls arrives at the same exact places at almost the same exact times day after day. As the season progresses, few of those hunters realize that the mature bucks they hope to surprise have been acutely aware of their own routines for weeks. There’s nothing sneaky or unpredictable about a permanent deer stand. It’s a great place to fill antlerless deer tags, assess young bucks and maybe even get a late-evening glimpse at a big buck deep in the brush. Serious trophy hunters know from experience, though, that it’s a far better bet to abandon the box blind and instead take a stand at the nearest unpressured hotspot. For that reason, next to a dependable rifle and scope, a lightweight and sturdy tripod stand is arguably the trophy seeker’s most indispensable accessory. Tripods are quintessential tools for getting within range of big, hard-charging bucks, testosterone-driven animals that constantly travel during the autumn “rut.” Highly portable and available in a broad spectrum of models and heights with various options and amenities, hunting tripods are best selected with practicality and function in mind. A 14-foot tripod with a circular steel railing, canvas cover and wrap-around drape is ideally suited to the sprawling terrain of the Texas Hill Country and Edwards Plateau. It’s an excellent choice as well for surveying the long, mesquite-fringed senderos of the South Texas Brush Country. But amidst the densely crowded conifers of the East Texas Pineywoods, where shots are likely to be 50 yards instead of 150, hunters generally prefer shorter, more compact versions. Quality tripods are built with cushioned seats atop rugged swivel bases that allow silent 360-degree movement. Steps are incorporated into one of the stand’s legs, usually as welded-on crossbars. Tripod hunters are wise to wear safety harnesses (essentially seat belts), for obvious reasons. Some hunters also use ropes to lift their rifles from the ground instead of carrying them on their shoulders. 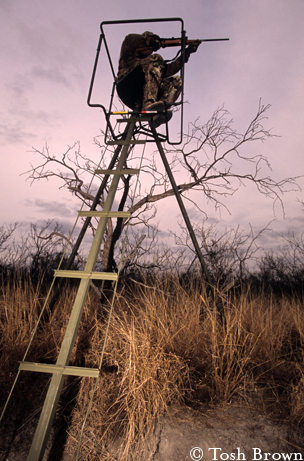 Regardless of height or design, a tripod requires hunters to use more focus and discipline than sitting idly in a box blind. Stand placement is critical. Tripods should be situated near game trails that exhibit definite signs of recent activity. “Scrapes” carved in the ground by the hooves of bucks to accommodate their scent and antler-induced “rubs” on the bark of saplings are both fail-safe calling cards of territorial white-tailed bucks. Nearby food sources are also invaluable. A single acorn-laden oak tree can make a huge difference in the quality of one prospective hunting site over another. Ideally, tripod stands should be placed downwind from your likely target. Furthermore, they should primarily face north or south to avoid periods of blinding glare during the prime shooting hours of sunrise and sunset. Tripod hunters should never forget that they are far more exposed than hunters in box blinds. Movement should always be slow, and kept to a minimum. Camouflage and strategically applied cover scent can also up the odds of success. All things considered and regardless of the blind, the hunter with the most patience almost always holds the winning ticket. Ultimately, waiting becomes perhaps the most difficult factor in the trophy deer hunting equation. Fortunately, and for good reason, patience is much easier to come by on a carefully placed tripod stand. It’s immensely encouraging for a hunter to know he’s visiting a site that’s frequented by deer far more often than deer hunters.